This mod makes it so that the rare and unique skillbooks for various skills are sold by Skillbook Vendors. Take the Walk in Shadows skillbook for example. Normally only 1 copy of this Level 1 skillbook exists within the game. 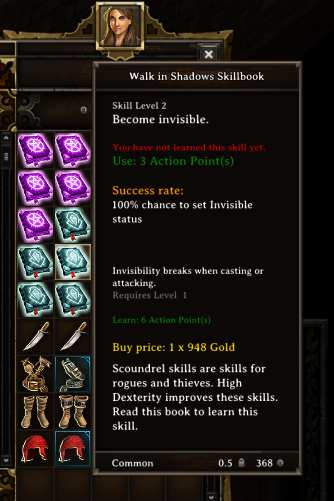 With this mod, it is possible to buy the Walk in Shadows skillbook from any Scoundrel skillbook merchant, and it's possible to find it as a random drop when adventuring. *Dust Devil does not originally have a skillbook associated with it. This mod makes a new skill entry that is almost an exact copy of the original skill, and makes a Skillbook that allows it to be learnt. Place the files within the Zip into the corresponding folder locations within your Divinity - Original Sin installation folder.